It’s Friday (thankfully not the 13th) and we just have to get something off our collective chest. There is a HUGE flaw in the DNS system and the Internet as we know it will probably cease to exist very soon. What are we talking about? The whole Internet rests on the shoulders of 13 DNS root servers. 13! Why on Earth would anyone do such a thing? They should just have stopped at 12 or pushed ahead to 14. Let’s have a look at some extremely sensible reasons to avoid having 13 root servers. Serial killers Jack the Ripper, Charles Manson, Jeffrey Dahmer and Theodore Bundy all have 13 letters in their names. Do you want a serial killer root server on the loose? The Apollo 13 space mission didn’t exactly go well, did it? Formula 1 cars don’t have the number 13 after several drivers with that number died in crashes. Servers and crashes don’t go well together, as you know. Hotels and buildings tend to sensibly skip the 13th floor (and room number 13). 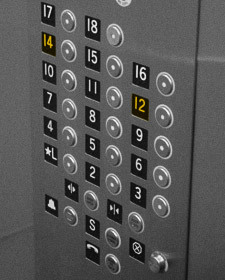 They have the 12th floor and then the 14th floor, just as it should be. Even Microsoft is avoiding the number 13. Their current version of MS Office is 12, but the working name for the next is MS Office 14. And if that doesn’t convince you, think of all the people out there with perfectly legit triskaidekaphobia (fear of the number 13). If there ever was a justified phobia that one is it. Heck, it’s not even a phobia. It’s common sense! Show some compassion.